There are a lot more beautiful places in this country than what we already know of. There is Boracay, El Nido, Anilao, Malapascua, and Coron – all these places have already found their way into so many blogs by backpackers and adventurers. No one will contest to their awe-inspiring beauty, but beyond these there exists unspoiled beauty. There are those places whose wonders lie hidden, known only to the people who have lived there. If you ever find your way to these places, you would want to keep it your secret. That’s how I felt when I went to MOAP. 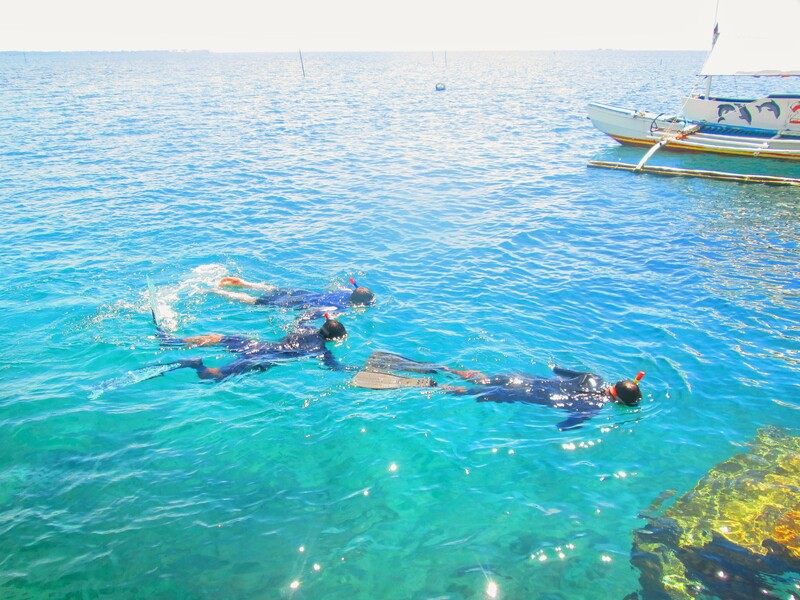 MOAP stands for Misamis Occidental Aquamarine Park. 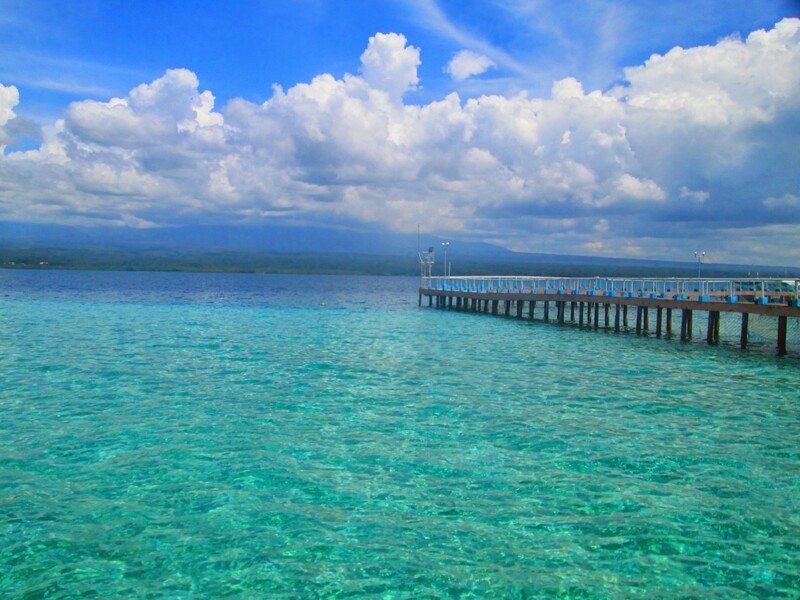 Misamis Occidental is one of the provinces of Northwestern Mindanao, bounded to the north by the Mindanao Sea and to the east by Iligan Bay. 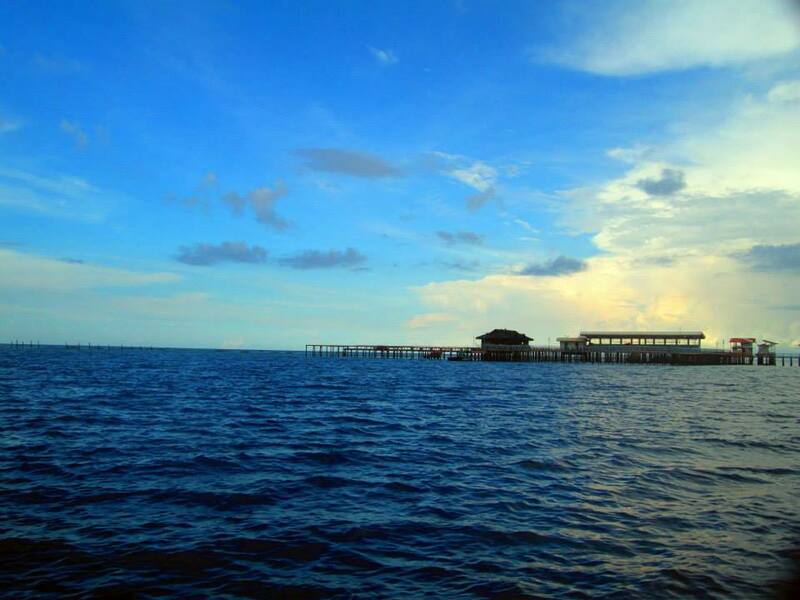 To the west lies my hometown Zamboanga del Norte. 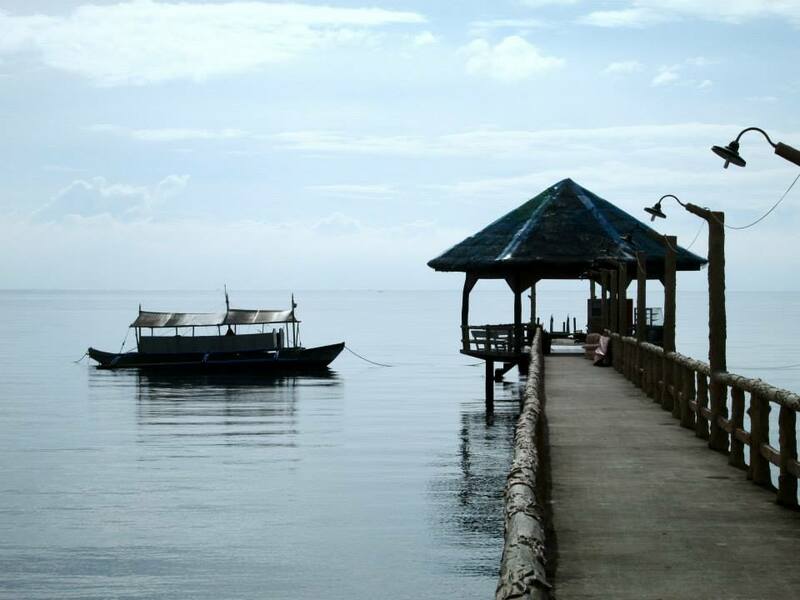 The easiest way to get there is to fly to Ozamiz City from Manila, and from Ozamiz the place is only about 30 minutes away. To tell the truth, this is not one of those places that no one has ever heard of. 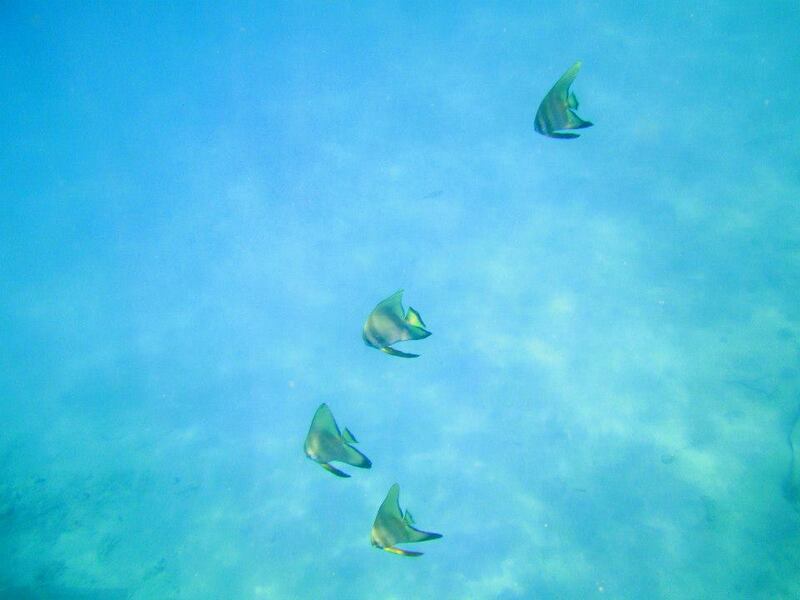 I have spotted a few locals coming here, at most 5 people snorkeling with us when we visited. The other guests go there to eat at the restaurant by the sea. There were a few foreign nationals (3 when I was there) but they must have been very adventurous to go all the way to Misamis Occidental. You’ll be able to see a few blogs talking about MOAP. Most, if not all, of the blogs are written by Filipinos but none of them prepared me for the feeling of wonder that I had when I was there. It was authentic and rustic and spontaneous. A feature about MOAP had been published on national paper before, most likely an attempt to attract tourists to the place. However due to several reasons, including the park’s distance from the airport and the main city, the place didn’t really become that famous. Their main selling point is the Dolphin Island, an offshore man-made island that houses rescued dolphins. When I first heard of it, I immediately crossed this place out of my To Visit list. I do not support parks and places that keep animals captive for the entertainment of human beings, but the allure of this relatively unknown place won me over. I live in the province just beside it and I couldn’t believe that I’ve never heard of this place before. I imagined the marine life here to be very diverse. So I made a decision to check it out (and promised to write something negative about the dolphins in captivity). So from Manila I flew to Dipolog City with my friend Jamie. 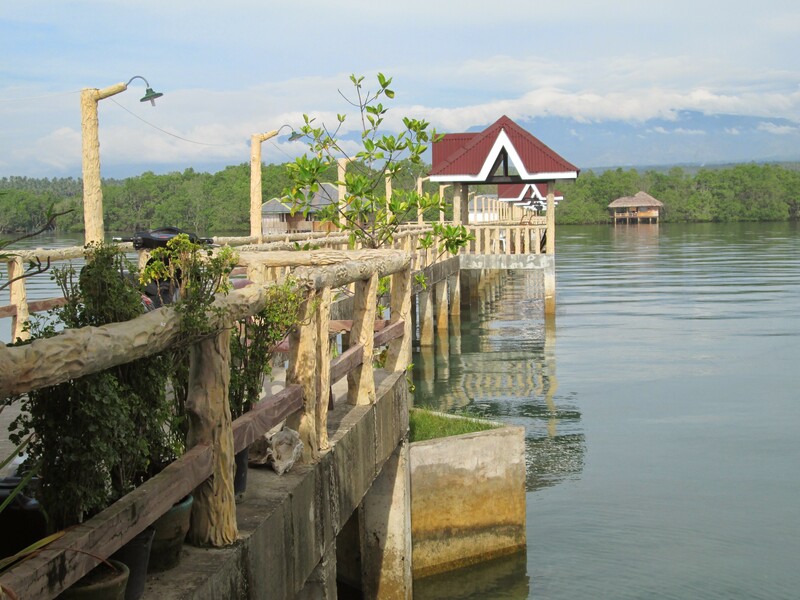 From there we took a 4-hour bus ride to the municipality of Tudela in Misamis Occidental. There are no big signs on the road that will tell you you’ve arrived at your destination. Instead you just rely on the kundoktor (the guy who collects the bus fare and shouts ‘Para!’ or stop) to tell you it’s almost time to go down. On one side of the asphalt road are rice fields and on the other side is a concrete road perpendicular to the high way and will lead you to the sea, your destination. 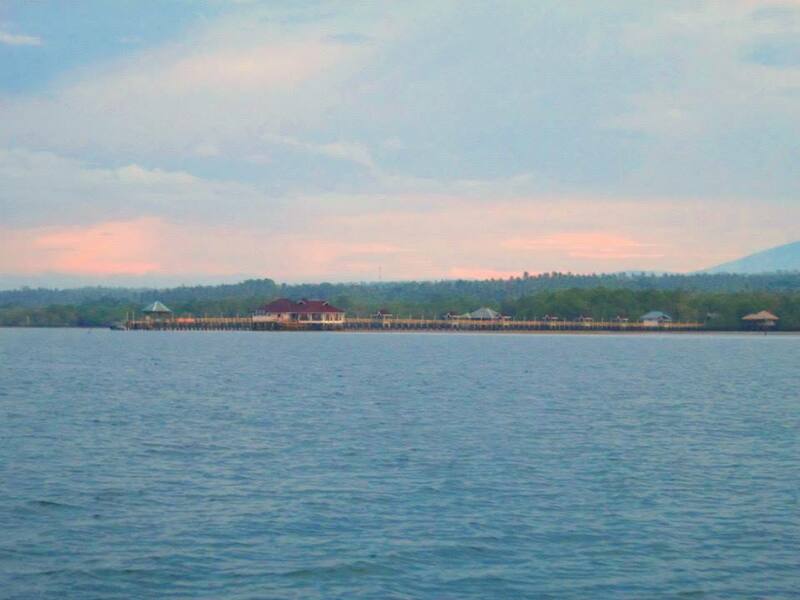 The outline of the town facing the sea is covered with mangroves. 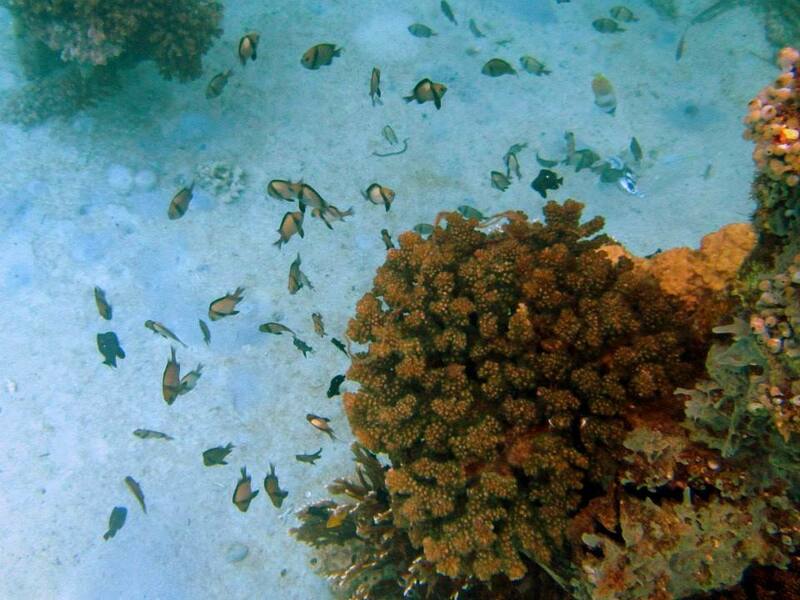 If there are mangroves, there are fishes. I was so excited. 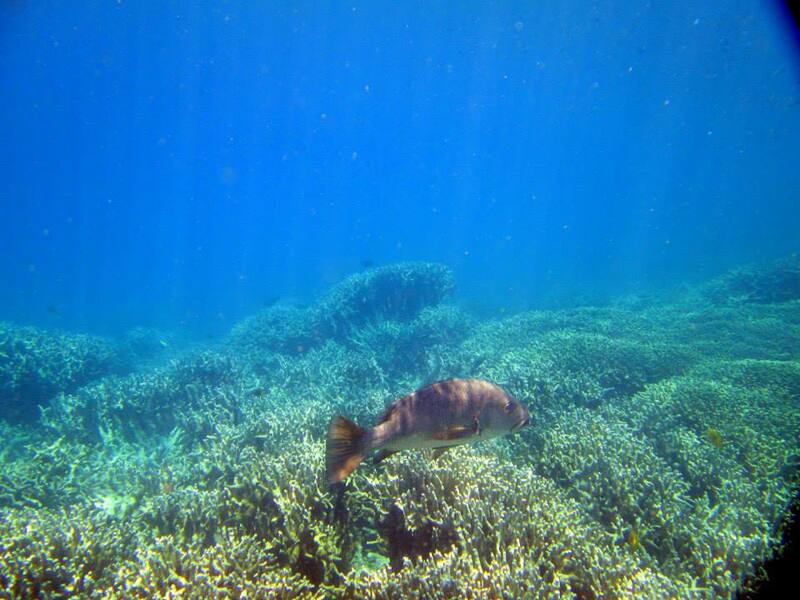 Mangroves are among fishes’ natural habitat and breeding ground. The cottages in the park were nestled among the mangroves. Don’t expect 5-star accommodation because these cottages aren’t managed by private hoteliers. Nonetheless it was decent with air conditioning, functional bathrooms, and a kitchen. The best I like about it was the first class view. 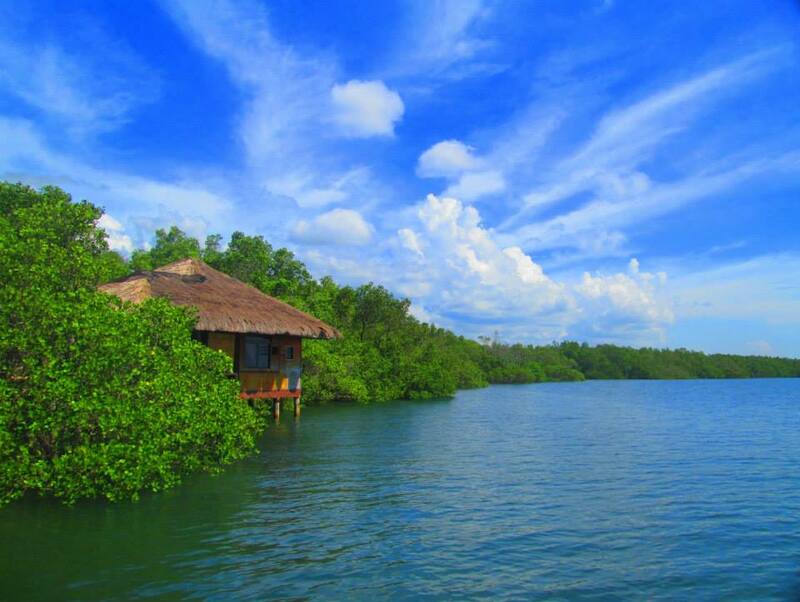 You wake up in the morning seeing the sun rise with its beams peeking through the leaves of the mangroves. I could talk a lot more about MOAP. I can describe every detail of the place but pictures paint a thousand words, so I’ll let it do the talking. This is the way to the park’s only restaurant. The food there is very good and the choices are many so we didn’t care if we ate there everyday. Waiting by the wharf, this is the boat that would take us to Dolphin Island, which is a 15-minute boat-ride away. This wharf is also just connected to the restaurant. On the boat and looking back, this was our view of the wharf, the restaurant, and the cottages. On our way to the Dolphin Island. 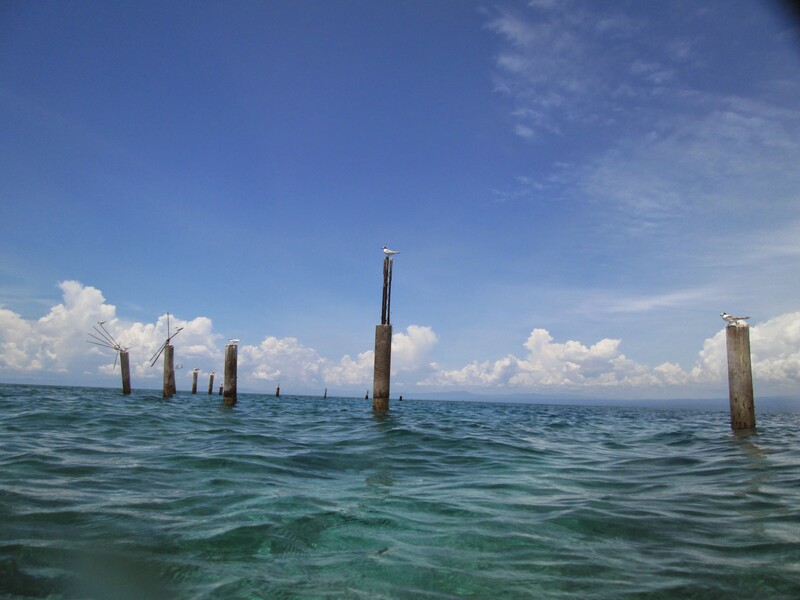 It stands on a sand bar and has an underwater pen for the dolphins. The place also has a restaurant but the food are not as varied as the one at the wharf. 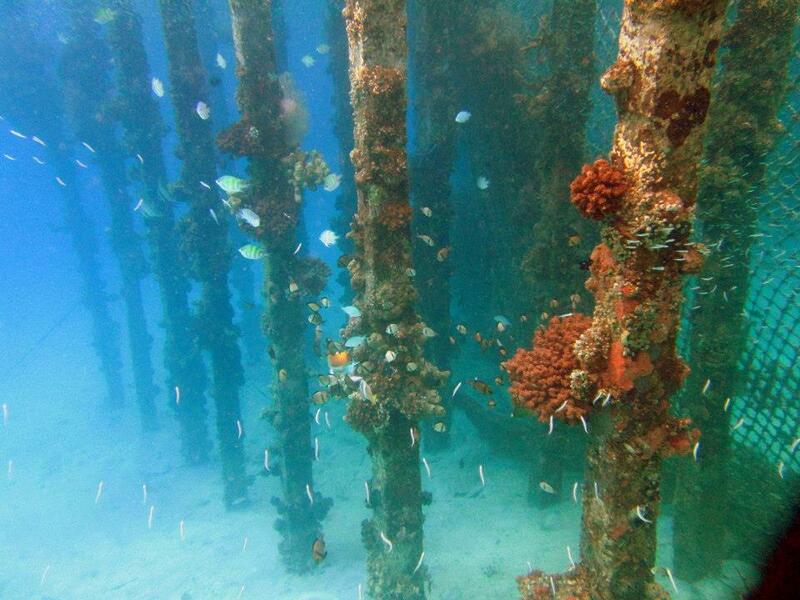 The underwater pen at the Dolphin Island. Guess what, there were no dolphins! I was so happy to hear that they have escaped. The caretaker told me there originally were 3 there, rescued since they were said to be wounded. I don’t think they release the dolphins immediately though even though they get better since it would discourage people to visit. 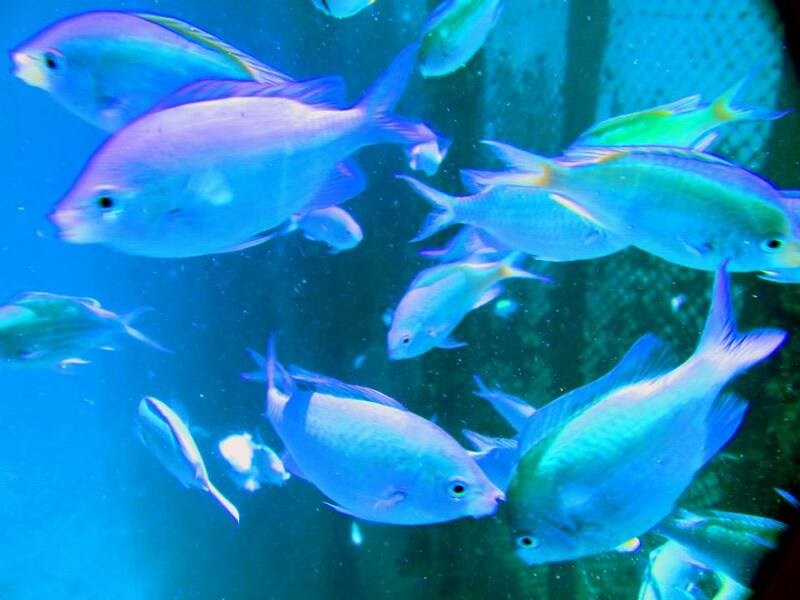 The dolphins however were said to have escaped through a defect in the net of the pen. I was happy they were free. 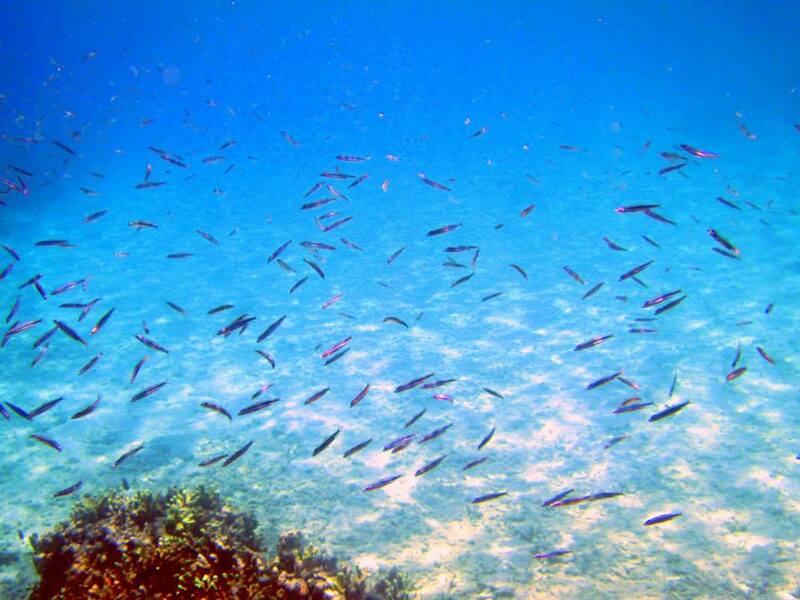 The marine life swimming freely in this blue sea was more than enough for me. 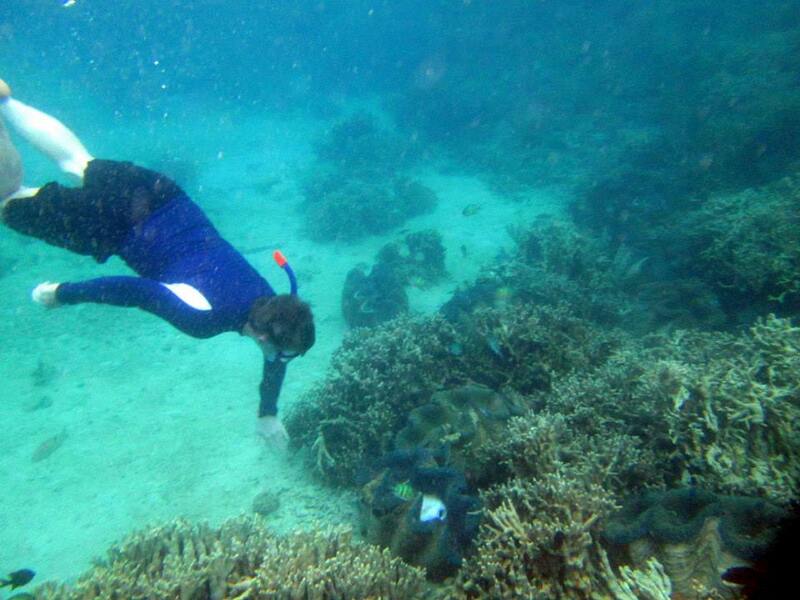 If you touch the brim of their shells, these giant clams close. 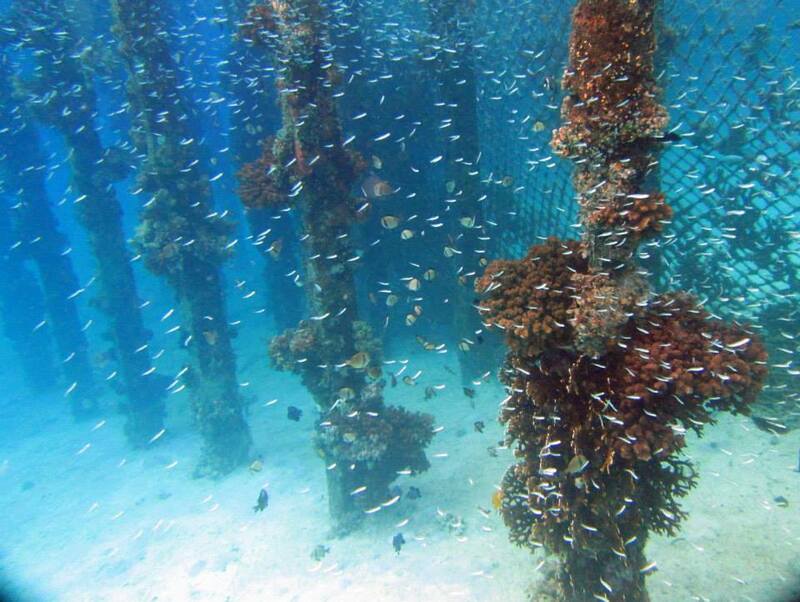 Corals that have attached to the posts of the underwater pens at Dolphin Island. When I was there I was so amazed at how they were so alive. I could only say wow in my head while looking at all the colors and how dynamic and alive everything that surrounded me were. This is the unfinished part of the park. I was told it has been like this for a couple of years and that’s natural with politics, change in leadership would end up to unfinished projects. We spotted these funny sea gulls who seem to like standing on the posts and they never want to share with another sea gull. If it were me, I’d like to keep the place as natural as possible. 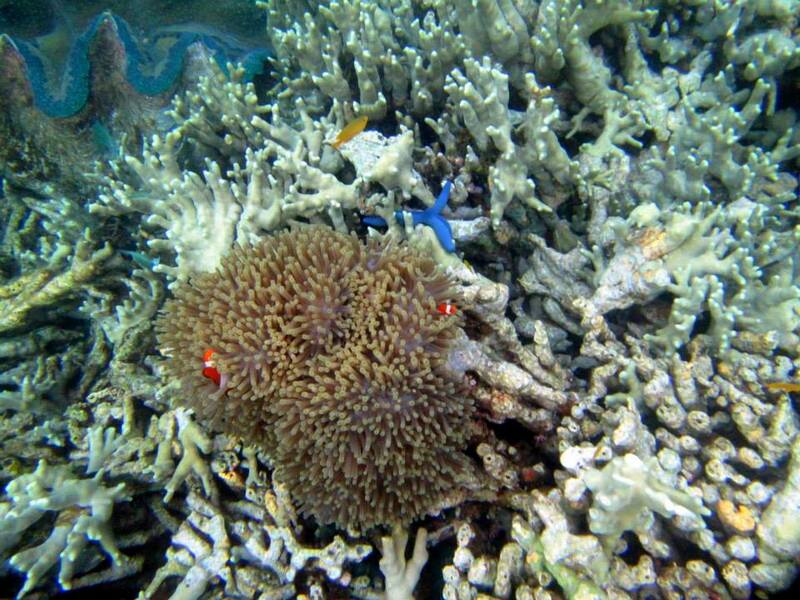 I wouldn’t want the diversity of the marine life and their undisturbed life changed. However, it is not in my hands what is to happen to MOAP. I wish that more attention would be given by the government in developing the place. What they could do first of all is to update the cottages so they aren’t so old, especially the bathrooms. But what I hope most of all is the development of the park as a center for marine science. There is potential for this place to be a study area for marine biology and even ecology as a whole. I hope in time it wouldn’t be forgotten, and I hope it remains in good hands. I will come back here one day and experience everything it has again. If you are the kind of adventurer who goes to places with no reservations and loves all the surprises of mother nature, then I highly recommend MOAP to you. It’s far but if you have the spirit and you are open-minded, then go to MOAP. Update: I have changed the title of this post due to certain things I have learned and some truths I found while visiting MOAP that I only decided to post just now. Wow lots of Tridacnas (giant clams)! I hope this place is strictly protected and properly managed. Swoon! It looks amazing! 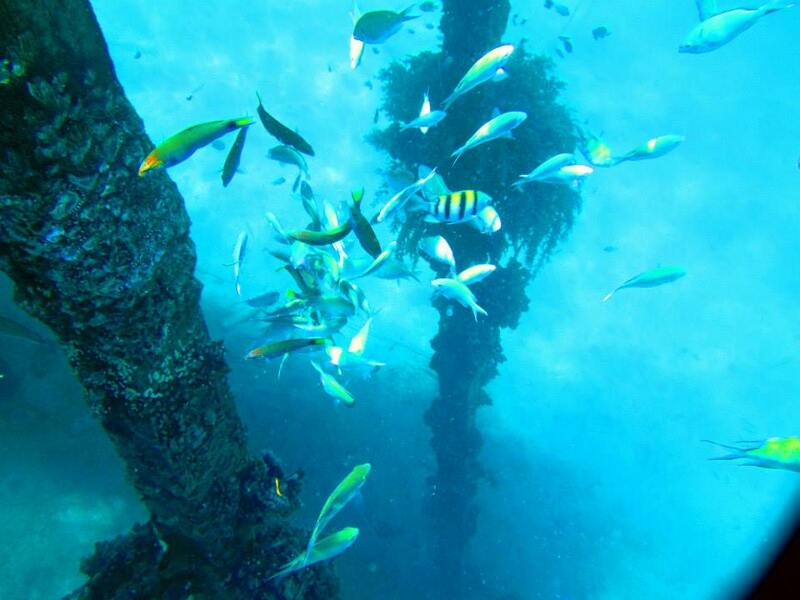 In the two tropical places I have visited probably one of the things that stood out the most was snorkeling and seeing the underwater life. One place was Hawaii, the other Tanzania. It is so important to protect these treasures of our world. Thanks for sharing. I wish to see Hawaii one day too and dive into its waters. 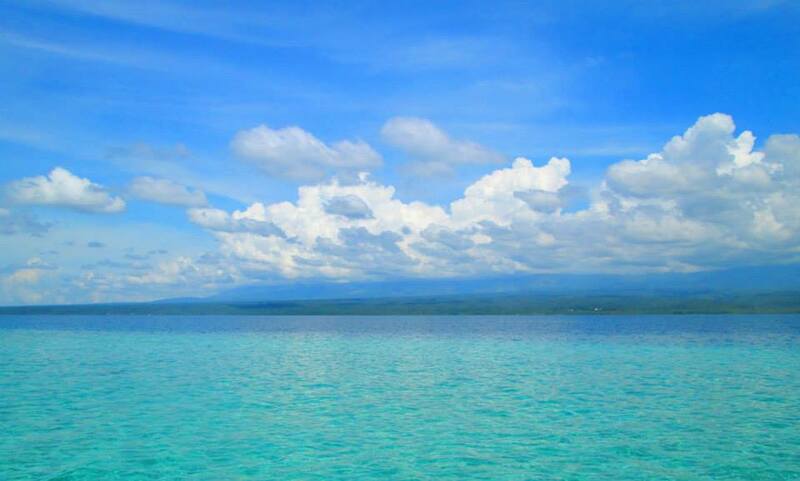 You are showing a lot beautiful places in the Philippines that i am check this February or March. Thanks for showing this. Thanks for reading too! 🙂 I hope you have a wonderful time back in the Philippines! Is moap still open? Ive read several negtive reviews about the place recently. Were planning to visit there last week of march. They are still open, but I don’t really have a contact number. I just went there without any reservations. However it can’t be denied that there is still beauty and wonder in the waters of moap. 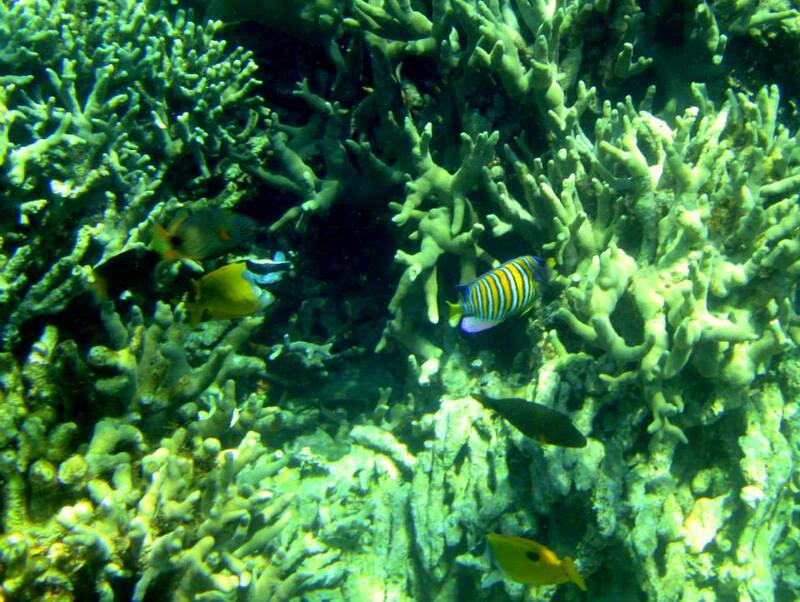 I loved the marine life there. Don’t expect to find dolphins, and don’t ever ever patronize those kinds of activities. It’s inappropriate and unethical. Thanks a lot for the info.. ill bring along my five year old son and im sure he’s gonna love it there. Wow! !great to hear that its still open. Ill bring along my 5yr old son there this holy week and im sure he’s gonna love it. Thanks so much for the info.